Just the weight I was looking for. It is nice enough looking to use as a bedspread. Very pleased with my purchase. I would recommend this product to anyone. Enhance the comfort and charm of your bedroom decor with this oversized down blanket. 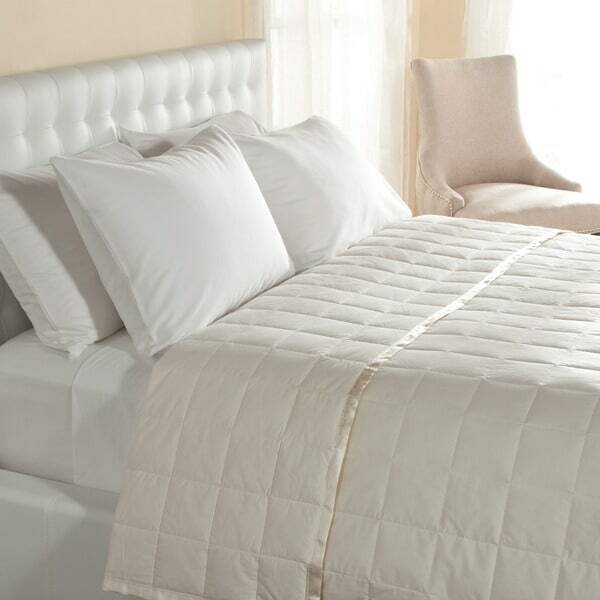 Crafted with a cambric cotton shell in your choice of white or ivory, the lightweight blanket has a 1-inch satin trim, and is filled with white duck down, kept in place with a sewn through box construction to prevent shifting. The blanket is both washer and dryer safe. While like the blanket it's not the quality I was hoping for. The ivory has a heavy yellow undertone but still pretty. Very generously sized with a narrow satin binding on all sides. The 230 thread count is so thin you can see the very dark colored down fill right through it (though none of the fill has come out as of yet). The description states it is 550 fill power but this does not keep me warm like others of the same fill rating I've had. I only washed/dried it once and had no issues. I would recommend for those looking for an extra light or decorative layer but if you need something for warmth, keep looking. Living in S. California, I looked everywhere for a down quilt/blanket. Finally I found this and am thrilled with the quality and just about everything about it. there is one issue to be dealt with and that is that it is huge. We should all have such a problem these days. We have a Cal-King bed and it fits about 15" down on each side and at the foot of the bed it is about 36" longer than needed. I don't find this a problem, I just tuck it under, and expect that when I wash and dry it in a hot dryer, it will in fact shrink. The edges are nicely bound with a narrow band, and I am confident that it will wash nicely. 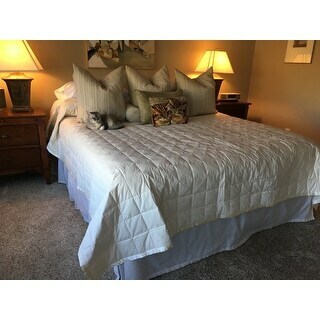 I have looked for ever for an oversized down or down alternative blanket in white for our king sized bed. The size of this blanket is wonderful! Most of the blankets barely tuck under the mattress and then there is even less after washing and drying due to shrinkage. I'm sure that this blanket will shrink since it is cotton but that's ok as there is lots. Now I ordered the white and it's not as white as I would have liked, it's more off white ( maybe they sent me the cream one but the label said white) and yes it does make the crinkling sound like another customer said, but that's what down filled blankets do. Overall this blanket is wonderful because of the size and a good price! Hoping to find a light-weight down blanket that i didn't need to throw off in the middle of the night for being just too warm, and one that wasn't terribly expensive, my research led me to this one and I am so pleased that it has done exactly as i had wanted. At times it reminds me of "Goldilocks" when she finally found the bed that was "just right". I finally found my down blanket that is "just right". I would have given it 5 stars however it does make that crinkle sound often found with down blankets. Very nice, not too thick and light weight but very warm. Have a king size bed with a very thick mattress and it tucks with left over on sides and bottom. Love it. This is a lightweight blanket that will be good alone for warmer seasons, or as a layer during winter. Be aware of your measurements - the oversized is HUGE but the next size down wasn’t big enough. No worries though, because with a blanket like this there’s no danger of anyone hogging the covers! It arrives in a compact zippered bag - don’t be fooled. Once you take it out and fluff it up awhile, it expands. It does have that soft crinkly sound (mentioned by other reviewers) that new comforters often have, but it doesn’t bother me and my husband has never mentioned it, so it’s a non-issue. I expect it to disappear altogether after a few washes. DownLite makes good products. Recommended! I have had this same blanket for over 14 years. It has made the same small amount of unnoticeable noise mentioned in some reviews, from day one (the sound does not disturb sleep!!). It has stood up to hundreds of machine wash and drying's, still looking as new as the day I got it. But, it is a queen and I now have a king bed. So, I searched the web. I was so surprised to find the exact same cozy, wonderfully made Blanket!!! How many times does that happen 14+ years later??? The price was still as reasonable too! I would recommend this blanket to anyone who needs a good night sleep (please note even a hot flash is not a struggle under this perfect temperature controlled cover). Couldn't ask for a better investment! I wanted a light duvet to use on warmer nights. I also wanted to use it inside my king size duvet cover. So, on looking at the product specs, I decided to purchase the queen size because the product is oversized. The width was perfect but I had to cut a few inches off the bottom to get it to fit inside the king duvet cover. This was easily done and a friend finished the cut edge with a few rows of zigzag stitches to keep the down in. It is perfect and, as I am recovering from surgery, it is wonderfully light on my poor hip!. As usual, Overstock delivered as promised. Description says it is filled with with down. Well the down is white and dark. The cover is thin and you can see the color of the feathers through the cover. Do not get this if seeing mixed color feathers through the fabric is an issue. Other than that it is nice and light and warm, but not too warm. This was exactly what I was looking for under a spread for cold New England nights. Down comforters are too warm for my husband and blankets are not enough for me. This is a great middle ground. There is a little bit of noise when the blanket moves but nothing disruptive. Love this blanket so much that I’m ordering another one for our vacation home. It’s beautiful & the perfect weight for summertime sleeping. Very well made, too. I absolutely love this blanket! It is so lightweight I hardly know it is on me. Yet it is so very warm. I love quilts but hate the weight and this is the perfect answer. The fact that it is machine washable is just icing on the cake!! I fell in love w down blankets at a hotel and I purchased this because it's the perfect weight (being in hot SoCal) for my duvet cover. I used it instead of a bulky, hot quilt and it serves ideally for my needs. I did tack the corners so the duvet wouldn't slip. This would also serve as a regular blanket. Love it! I wanted to love this blanket . The ivory color was a perfect match to my comforter background . The weight and feel were great to but very shortly after putting it on the bed I was noticing dust bunnies on my hardwood floor. Then more and more until I just knew it had to be the down from this blanket. I had to return it which was not a problem at all. Bought as a gift and mom loved it! Super soft and keeps her warm without being too heavy. The color was perfect. Great for summer and winter. I'll be getting myself one as well. It's lightweight, good for all year. The down doesn't clump.Washes well. Fabulous blanket...ordered one for every bed! I highly recommend the down blanket with the satin trim. I had the best night sleep that I’ve had in a year. I had one of these previously but didn’t get it in the oversized. My husband and I are always toughing on the covers because there wasn’t enough room. Last night was neither one of us want to get up. The temperature of the blank was just perfect and the material that was used was so comfortable. I am so happy that I have purchased this from overstock. My husband and I use this blanket every night. Not too hot, not too cold. Also, easy to wash.
as described. I had to search for the oversized in a beige/cream. Very happy with it. Great size, great weight and an EXCELLENT price!! "What size are the squares?" The squares are approximately 4 inches. "Based on other questions - Is the fill down or down and feather? The description also says cotton shell, not polyester. ???" "Is this blanket light enough to use in the summers in Ohio?" Should be fine for summers in Ohio. "Can I use bleach when washing it?" No. If down will turn the down pink. "What material is the shell and is it cool to the touch ..Meaning when you move your feet or legs you get a cool feeling on them?" The shell is 100% polyester fabric. Cool is a matter of opinion. To the touch it is cool, but my bedroom is kept very cool. Not sure if this is of much help. I will say that we are very pleased with our blanket. "Hi, what is the actual size of the queen? Thanks!" "Would the queen size be way to big for a full size bed? Thank you in advance"
The queen size is very generous on my queen size bed. So I think it would probably be too large for a full bed. Unless your bed is quite high off the floor, I think it would be too big. It is generous as a queen with a very large overhang.. I don't know the difference in the width if a full versus a queen. I think it is approx 6 inches 3 on each side. It really is a matter if what look you are going for. That would be your call. On a Queen size bed the blanket goes down 17 inches on each side. On a Full be the blanket would hang 20 inches down each side. I usually have the problem of my husband rolling over taking the blanket with him but not with this blanket. It is thin enough that you can easily tuck the sides. i saw on Martha Stewart's show years ago that she ALWAYS goes up a size when buying bedding . . . meaning she buys a Queen-sized blanket for a Full-sized mattress, same for TOP sheets. If she has a fitted sheet with elastic all the way around, instead of just at the corners, she again goes up a size, if she has a deeper mattress. I have been following these rules since then, and I love that I am still covered up when my (blanket hog) husband rolls over and takes the blankets with him.